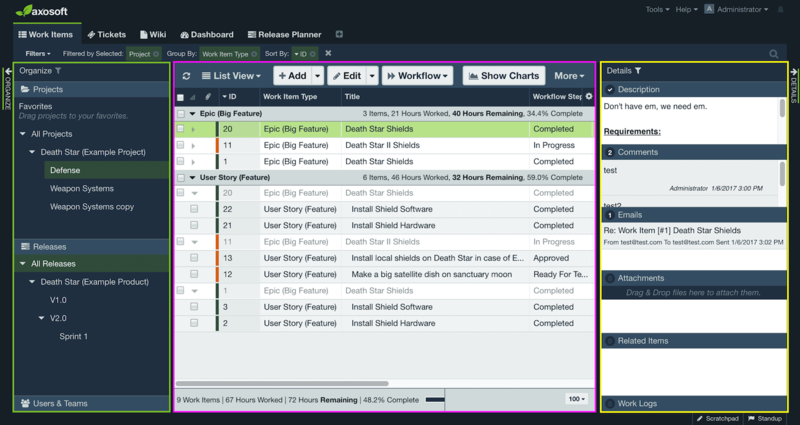 Plan Sprints and Releases Accurately - Axosoft Release Planner allows you to see the capacity of your sprint, team, and team members at a glance. Stack Ranking - Use Rank Mode to stack rank your items from highest to lowest priority in your backlog. Estimating - Estimate accurately using minutes, hours, days, weeks or even story points. What you see in Axosoft is governed by your Tab selection. By default, you may have tabs like Work items, Release Planner, or Dashboard. Clicking each of these will change what you see in the application, and you have the ability to add additional tabs by clicking this icon.